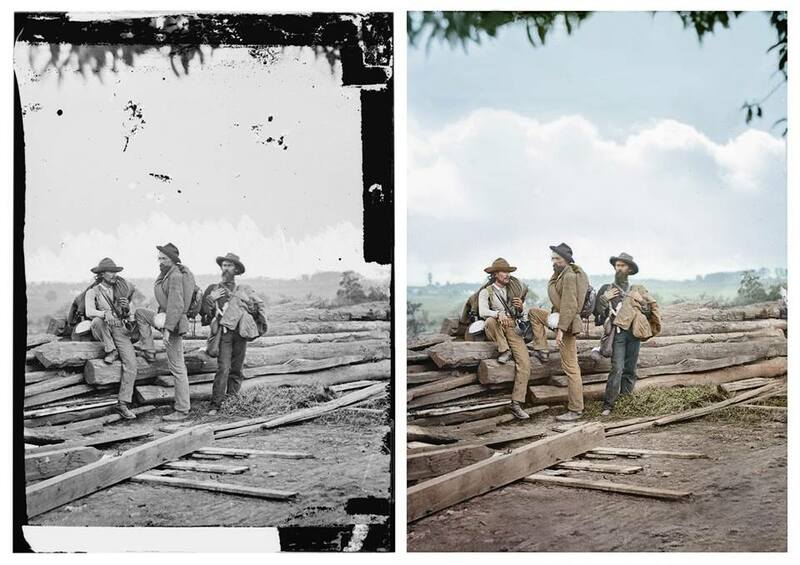 A recent article in the Daily Mail drew my attention to a small group of professional colorists who have been using digital media to colorize photographs of the American Civil War — some iconic, and some quite pedestrian. Much of the online chatter about the pixel-pushers celebrates their ingenuity, patience, and skill in bringing history to life. Some of the images are truly remarkable in the way that the simulated color adds texture and depth and a sense of reality to scenes we’ve only experienced in grey-scale, but many of them look much like any well-hand-tinted photos of the past century. Some, to my eyes, are too cleaned-up to convey the historicity that they are meant to salvage, and that the faded, scratched, and worn paper or tin or glass originals embody. Is color the only means by which we are meant to connect to these timely things? Does removing the photographs themselves (as objects, not only as images) from their own time and technologies of production and reception damage them in other ways, not to mention our ability to relate to them, or to their subject-matter through them?